Get rid of your ferrous and non-ferrous metals in Atlanta today. Drop-off your unwanted scrap metal at our recycling center. Do you have some ferrous or non-ferrous metals laying around your construction site, industrial facility, or home that you need to get rid of? At North Fulton Metals, you’ll get paid for your scrap metal recycling. Whether you have brass recycling, aluminum recycling, ferrous metal recycling, non-ferrous metal recycling, or more, you’ll get more for your solid waste recycling here at North Fulton Metals in Atlanta. Want to know what you can get for your scrap metal recycling? Contact our recycling center to learn more and get a free quote. Why choose North Fulton Metals? Whether you’re trying to safely clean up your construction site, or you’re looking to get rid of that scrap metal that’s been occupying your garage for months, North Fulton is ready to help you. Schedule your appointment at our Atlanta recycling center, or keep reading to learn more about our scrap metal recycling services. Ferrous metals contain iron, and therefore usually have a magnetic charge associated with them. These can include different forms of iron, like cast iron and wrought iron, steel, such as alloy steel and carbon steel, as well as other commercial and domestic metals. These metals don’t contain a magnetic charge, which makes them perfect for electronic applications. Metals like copper, aluminum, zinc, gold, and more are all considered non-ferrous. Recycle your non-ferrous metals at North Fulton Metals today. Get paid for your scrap metal recycling with the experts at NFM. 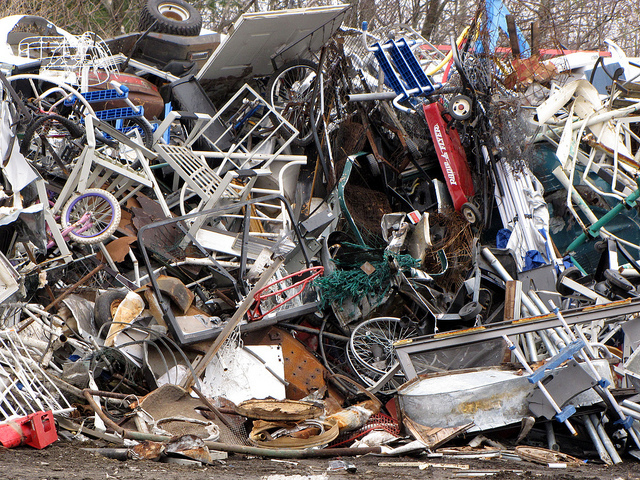 Our professionals will be able to assess your scrap and give you a fair price. Learn more about our scrap metal recycling and set up your appointment at our Atlanta area metal recycling center.